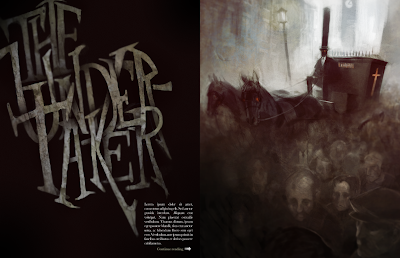 M. Puncekar Illustration: Type Treatment and Layout for The Undertaker. Type Treatment and Layout for The Undertaker. This is the second part of the assignment for the "Professions" piece. I was on a crazy deadline for this, and as a result this was done during a completely sleepless time, therefore making me like it even more. I had to do a bunch of self branding due at 8:00 in the morning and this was due at 12:30. So I stayed up all night and did this directly over the text I drew out, just pushing and pulling at it until I got this kind of barely readable but fun thing happening. I wanted something pretty different, rooty, and dirty for it. Also finished a mini piece I'll post later tonight for the word's "Wet" and "Willy". See ya then.